We will depart louisville this morning and travel north to Indianapolis for a morning break. We will continue on to Fort Wayne, IN for lunch. Our afternoon travels take us to Bronner's CHRISTmas Wonderland in Frankenmuth, MI "Little Bavaria". The sights, sounds, and spirit of Christmas completely surround you at this amazing store, which is the size of one and a half football fields, overflowing with 50,000 trims and gifts. We will overnight in the quaint village of rankenmuth at the Spring Hill Suites by Mariott. After we check-in, a family style chicken dinner awaits us a the world-famous Bavarian Inn Restaurant (included). Hot breakfast included at the hotel. This morning we drive across one of the world's most beautiful bridges the Big MAC Bridge to St. Ignace where we will board our ferry to Mackinac Island. Upon arrival, a real treat awaits us...the legendary Grand Luncheon Buffet, a distinct highlight of the Grand Hotel. After lunch, we will take an Island Carriage Tour. The tour ends downtown. You may go to the hotel or visit the downtown shops. The rest of the day is free to explore the island!! You may stroll the shops, walk some of the endless nature trails, or just enjoy the hotel. 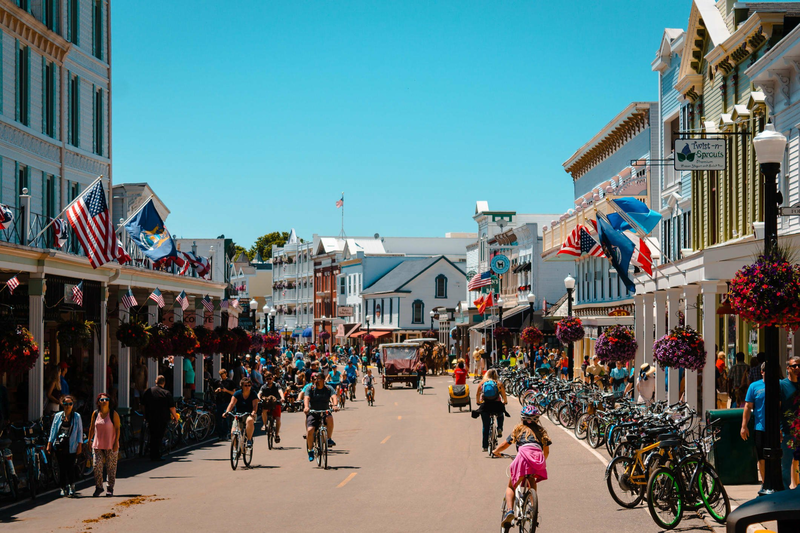 Don't forget to pick up some Mackinac Island fudge. Our home for the next 2 nights is the beautiful Lakeview Hotel, located in the heart of the historic village. When you go to the hotel, let them know you are with Miller Transportation group and they will give you your room key. Today is free to enjoy the island!! The Island is a shopper's paradise. You may want to rent a bicycle to do some sightseeing or may just want to relax at the hotel. There is truly something for everyone!! A complimentary breakfast is included at the hotel. Today promises to be a fascinating adventure into the past at Castle Farms, a great destination with lush gardens, motel railroads and historic stone walls and towers. We will enjoy a guided tram tour of the farms and gardens before. Don't forget to visit the 1918 Museum full of memorabilia from the Great War. After our tour, we will be served a royal luncheon!! The fun isn't over just yet!! After lunch, we will take a guided tour of the Earl Young Mushroom Houses. You will marvel at the unique stone dwellings, cedar shake roofs and natural aesthetics, something you have to see to believe. We will overnight in West Branch, MI. Enjoy breakfast at the Lumber Jack Restaurant before our return trip home. We will arrive back in Louisville at approximately 6:00pm.